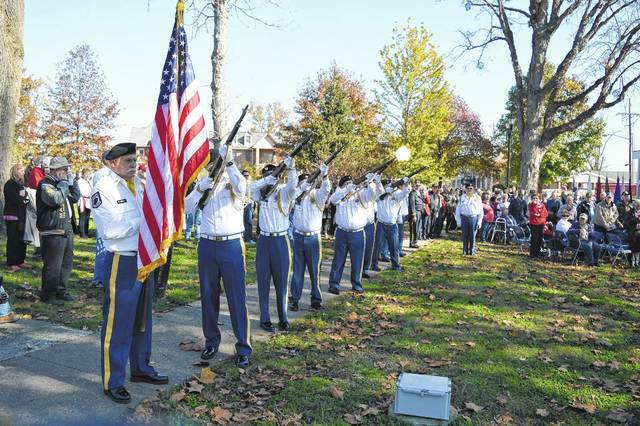 VFW 4464’s Honor Guard fires a salute at a previous Veterans Day ceremony in Gallipolis City Park. 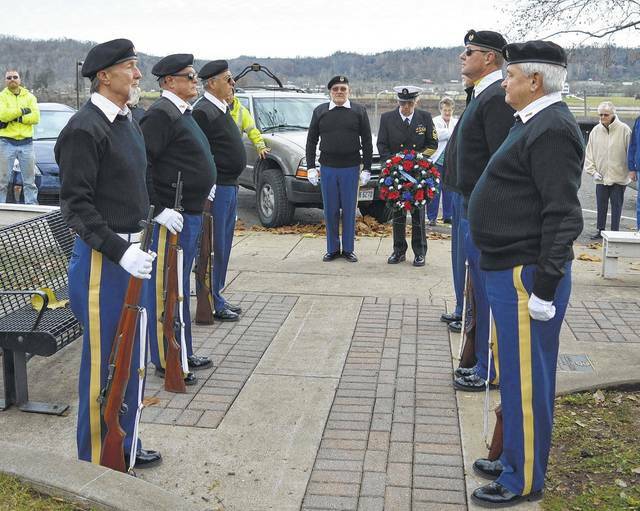 VFW 4464’s Honor Guard holds a ceremonial wreath placing in memory of those who served at Pearl Harbor. GALLIPOLIS — As a tradition since time immemorial, cultures across the world have remembered their fallen warriors’ sacrifice during their final death rites and the VFW Honor Guard is no different, serving as a final watch as respected heroes are put to their eternal rest. Veterans of Foreign Wars Post #4464’s Honor Guard attends every veteran’s funeral possible, laying Gallia’s passed veterans to their rest with the appropriate flags and ceremonial signals given. Along with its ceremonial function, the guard has often worked alongside area charities and alone to provide Christmas donations for children or donated coats, hats and clothing for elementary school students in need. The guard has also hosted fish fries and other such dinners in support of local schools. The post’s honor guard was also recently appointed by Ohio’s VFW to be the state’s honor guard for the following year. Mangus said he’s been in charge of the honor guard for over the last four years. With that, putting together a guard member’s uniform, buying ammunition for rifle salutes as well as weapon maintenance and travel costs can add up, he said. The guard is made of roughly 12 members, most of them combat veterans of the Vietnam War. A few younger veterans in their mid-20s have recently joined, said the commander. The group currently travels in an early 2000’s Suburban that Mangus says is starting to show some of its age and can’t fit all guard members as they travel to an event or funeral rite. The post and guard will continue holding fundraising events and dinners for charity functions. They’re asking the public for some support as they seek to replace their guard vehicle this year. An account has been opened at the Ohio Valley Bank in the post and guard’s name for those who would like to donate and show their support.